It all started with a bottle of frozen buttermilk. My philosophy with cooking is to work with what you got, when possible. My mother always says you should plan a menu based on what you see is fresh at the store. Borrowing from that idea, I try to plan based on what is on hand at the house. On the flip side, I tend to go to the store armed with a list inspired by two or three recipes I want to try and have prepared over the next few days or week. As for the buttermilk, before our last trip, I put the milk in the freezer. Here’s how I went about it, one dish at a time. Before pulling out all the ingredients, preheat oven to 400 degrees Fahrenheit with cast iron skillet inside. Ingredients: Lamb’s Stone Ground Yellow Cornmeal (1 ½ cups), combined with ½ cup bread flour, 4 teaspoons sugar, 3 tsp. baking powder, ½ tsp. 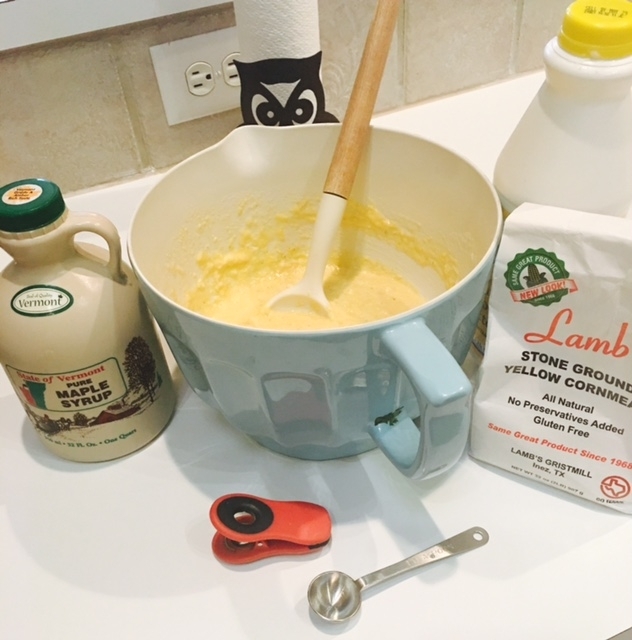 salt, 1 cup buttermilk, ¼ cup oil, 2 eggs and a 1/4 cup of real maple syrup. Directions: Simply put all the ingredients in one big mixing bowl and combine with a spoon or spatula. Pull out preheated skillet and place on stove top. Spray skillet with canola oil spray. Pour cornbread batter into greased skillet and place in over. Bake for 25 minutes or until golden brown. Place on stove top to cook. 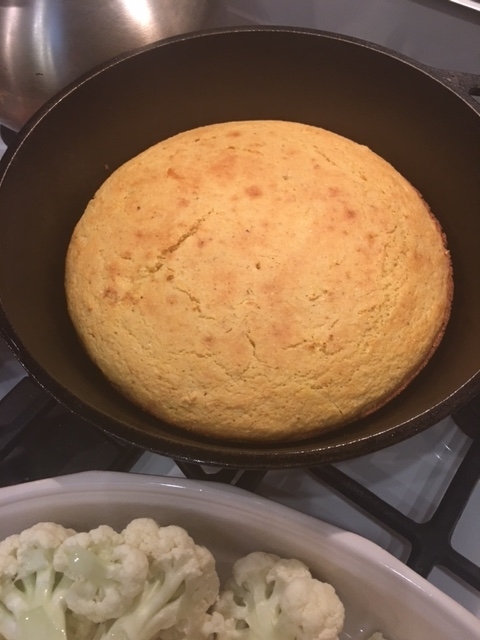 The bread should easily pop out of the skillet when cooled. 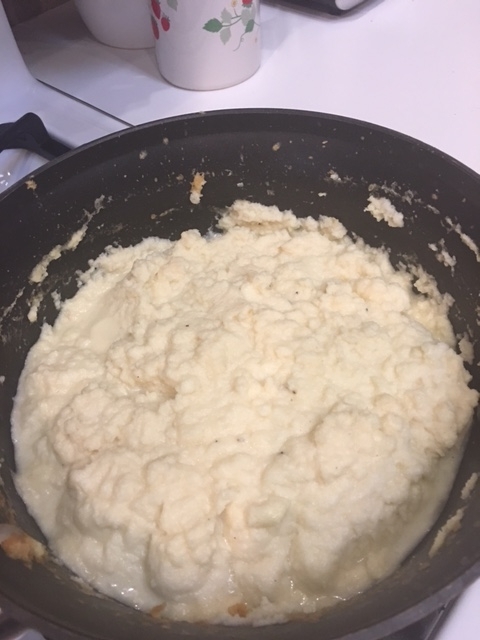 Mashed cauliflower: Ingredients to have on hand: one head cauliflower, garlic cloves, buttermilk, butter and olive oil. Break apart cauliflower and put florets in a microwave-safe dish. Add two cloves of peeled garlic (I initially used four cloves and it was, ahem, a bit too much). Cook according to your microwave’s instructions for cooking vegetables. My Chef Mike actually has a specific setting for cooking vegetables and amounts by cups. Then put cooked florets in a large food processor. Add a tablespoon of butter, an ample splash of buttermilk, cover and crank it up. Open the top that allows the addition of further ingredients and add more buttermilk and drizzles of olive oil until combined. As it turned out, my batch had too much buttermilk so I ended up heating it on low in a saucepan to reduce the liquid. Later, I added some shredded Parmesan cheese. 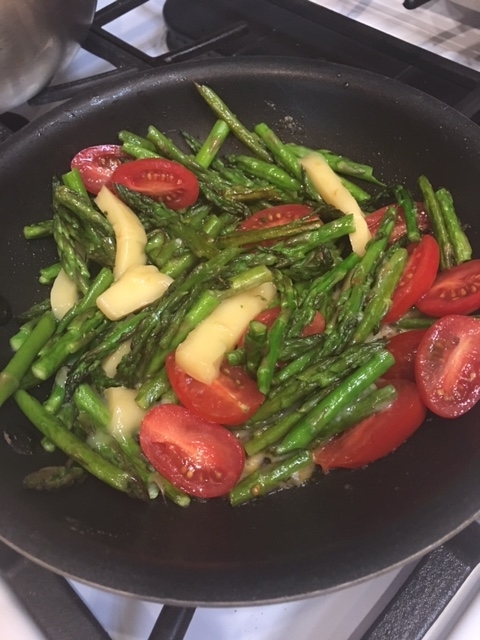 Asparagus: Rinse asparagus in a colander, snap off ends, then snap into little pieces (1.5-2 inches). Saute in a nonstick pan. Once nearly cooked, add salt and sliced grape tomatoes. Finally, add some cheese. I used a raclette cheese, which is soft and strongly aromatic. Grind on black pepper. This all came together and was served with venison steaks. It was a nice Sunday dinner and a good way to wrap up the weekend. It also was a great way to use the buttermilk that had been waiting in the freezer to be loved. I may just go get another piece of cornbread now.